Are you a digital marketer managing Google AdWords campaigns either for your own company or for your client and are not satisfied with your account performance? 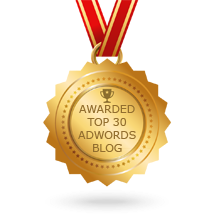 Are you looking for ways to boost your AdWords performance? You are at the right place. Here we will discuss some of the easiest ways in which you can take your AdWords campaign performance to the next level. Before we deep dive into optimization strategies first let’s take a look at probably the most basic marketing lesson that is described with the smallest possible acronym: 4Ps. Product, Price, Place & Promotion. Be it traditional or digital, these four 4Ps are essential for any marketing strategy to succeed. These 4Ps are essentially telling you that you need to promote a product that your customers value and is priced as per its competition and do so at the right place and at the right time. Though at its core this is so basic that many of us manage to miss it while setting up their campaigns. In this blog we are just going to apply this simple principle to our real world AdWords management and see how we can optimizing PPC accounts. These 4Ps can be interpreted in multiple ways and the best possible way to interpret them is: “Your best customer is the one to whom you don’t need to market”. At first this may seem bit counter intuitive since 4Ps are taught in marketing lessons and it would not be intuitive to interpret them as not to market. Your best customer is at the place where you are promoting your product, sees value in your product and is happy to pay for your product. So, it is all about finding your right customer. You are just going to do the same with our PPC and while doing so boost your campaign performance. If you have worked with Google AdWords, you might have come across a geeky term called Geo targeting. In the lay man terms, Geo targeting means: “Your best customers can found in specific geographic locations”. Geographic location here literally means the place at which your best customer resides or buys products. By knowing all such geographic locations one can update one’s marketing strategy by creating marketing campaigns specifically ‘targeting’ such locations and thereby acquire one’s best customers. Now the point is how to find geographic locations which are homes for your best customers. Google AdWords provides good amount of geo specific data using which one can create a Geographical Distribution visualization report such as below. 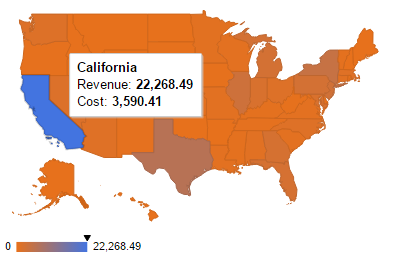 In the above form of visualizations one can color code different states using multiple metrics. 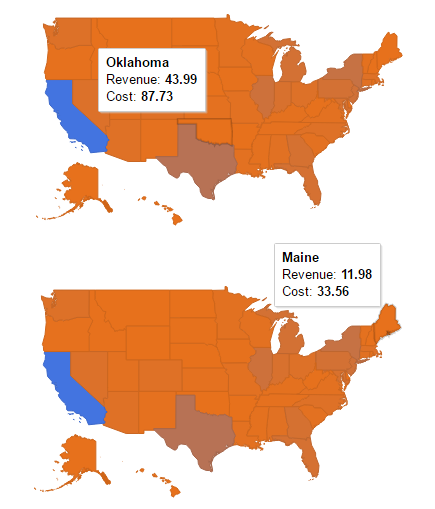 We suggest you to start by color coding on the revenue metric. 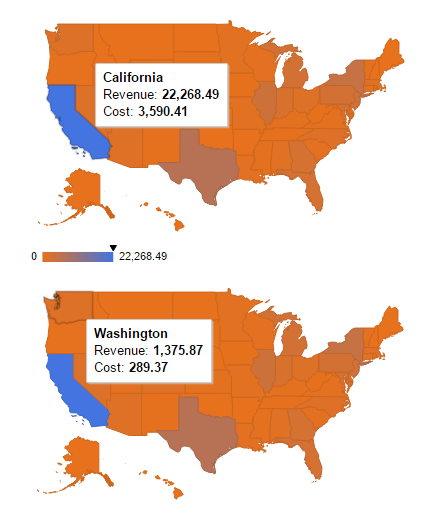 Also, it is advisable to have both cost and revenue metrics shown on the visualization – this is to easily identify ROI per geography. Such visualization provides you some very interesting insights. Zero revenue geographies: In order to identify geographies which are not giving you any revenues look at geographies with odd colors. Following are some examples. 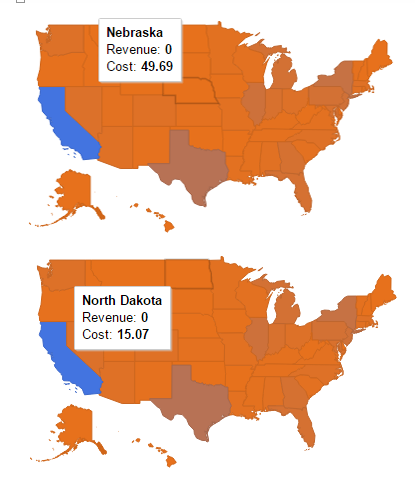 As one can see that, states Nebraska and North Dakota are not performing well in terms of revenues. Clearly your best customers have migrated out of these states. High revenue geographies: Some geographies generally have high concentrations of shoppers which make them must to target geographies. As the dollar amount of revenue that one can get out of these geographies is huge it would be foolish to ignore such geographies. From the following image clearly California state needs a special attention by the marketer since it is the most of revenue generating state and any bad performance within this state would have adverse effects on the top line. High ROI geographies: Revenue generating geographies definitely have good concentrations of your best customers but it is highly likely that your competitors are also selectively targeting such geographies. So how do you factor in such external factors? Thankfully it is not as difficult as it sounds. One just needs to look at other and probably the most important metric called ROI – return on investment. Going back to the 4Ps principle which says one doesn’t need to market to his best customer: one can acquire best customers with minimal to zero marketing spend. Geographies which are resulting in high revenues at the expense of least marketing spend are the places where one can find the best possible customers. So, just use the metric ROI which equal to Revenue/Cost to identify the high returning geographies. Sub-Optimal ROI geographies: In these geographies one needs to spend more than the returns to get some customers. These geographies have cost greater than revenues and therefore have less unity ROI values. Clearly these are the places which are devoid of your best customers and it is a must not to target such regions. Following are some self-explanatory sub-optimal geographies. Sometimes numbers can be deceiving and following the final metrics without actually understand the data may turn out to be bad suggestions. Here are some of the simple sanity checks that one has to take before concluding on the geographic targeting strategy. Too little data to confidently conclude anything: There could be cases where the PPC spent is too little to make any decisions with at most confidence. 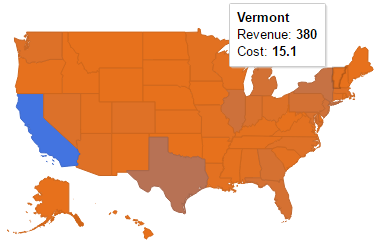 Look at Vermont which has whooping ROI of more than 20. But the denominator, the cost term too little to take a confident action on it. 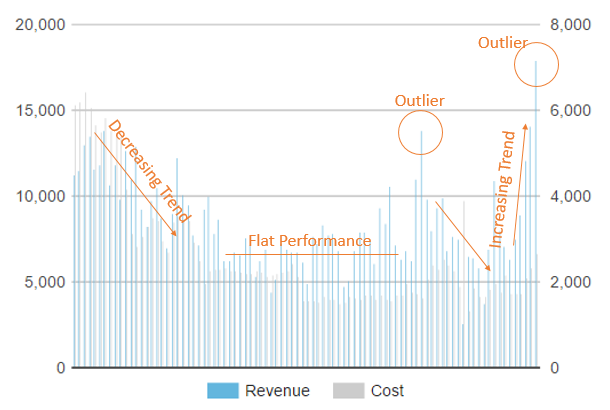 The cost value is too small that any increase in cost may not give you proportionate revenue growth. Hidden Seasonality: Probably one of the easily made mistake by marketers is giving over emphasis on certain type of analysis and completely ignoring the other. It is imperative to try and eliminate all the known external effects before starting a geo-based campaign. Seasonality is one such hidden external effect. Seasonality in some cases is specific to states and can potentially affect the geo-analysis we just made above. There could be a local festival because of which there were high sales or there could be local disaster because of which there could be fewer sales. 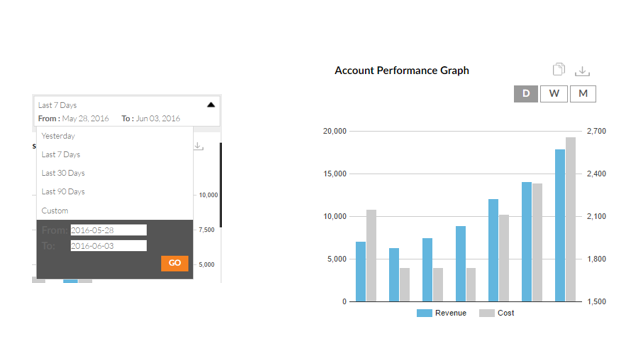 In either case, it is good to take the help of a graph that gives you account performance on daily basis. Always plot Revenue and Cost data on daily, weekly and monthly basis and also try analyzing the data by selecting date ranges for last 7 Days, last 30 Days and last 90 days. As you can see from the above chart, one can deduce outliers, decreasing, increasing as well flat trends in the account performance. These trends throw light on whether such trends caused good or bad performance for certain geographies. Always exclude outlier data as they give rise to very skewed analysis. Always factor in increasing or decreasing trends before considering new geographies or discontinuing existing geographies. 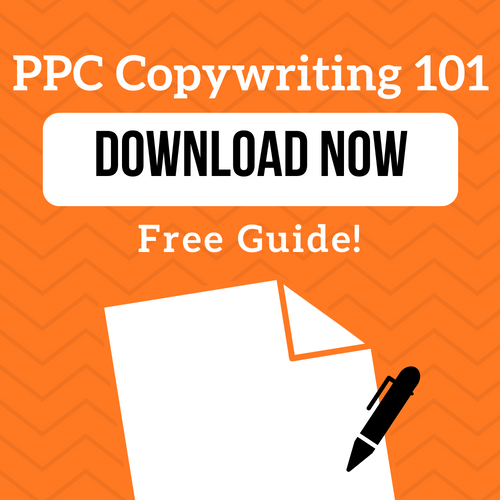 In sum, follow these simple steps to effectively boost your PPC account performance.